The Columbia River Basin is experiencing a predictable disaster this summer. 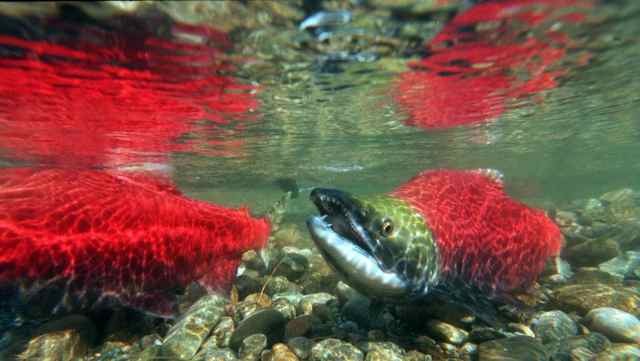 Nearly a quarter million sockeye salmon, including Idaho's endangered sockeye, have been dying as they confront water super-heated by warm weather, low snowpack and a system of dams that cooks the water in its reservoirs to levels that are flat-out lethal for salmon. It's not only sockeye that are suffering. Sturgeon that have been plying the Columbia River's waters for nearly a century have also turned belly up. So, too, did more than 100 spring chinook that died in early July in the Middle Fork of the John Day River. Salmon are a cold-water species that start to die when water temperatures rise above 72 . Temperatures in parts of the Snake and Columbia rivers approached 80 degrees this summer and have consistently been above 70 degrees -- a full 10 degrees warmer than normal. Unfortunately, this is not just a bad summer, but the result of a long-term failure by federal hydrosystem managers to fix a broken status quo. The conditions that led to this summer's losses were predictable and inevitable -- and will happen again. The only way to deal with this problem effectively is to remove the lower Snake River dams. Idaho's salmon were listed under the Endangered Species Act in the 1990s, and since then federal agencies have produced four illegal salmon plans. All four of those studies were overturned by federal judges for failure to consider lower Snake River dam removal. Make no mistake. This year's low snowpack and hot summer temperatures would have been difficult for salmon in a day and age without dams or human influence at all, but we haven't done the species any favors by heating the water further and slowing transport times for out-migrating smolts. Federal fisheries managers estimate that we'll lose 80 percent to 90 percent of sockeye salmon returning to Idaho this year and about half of the unlisted sockeye headed for tributaries of the Columbia in the Cascades. These are the same managers who, only 11 months ago, held a press conference to pat each other on the back and tout the difference they were making for salmon. NOAA Fisheries, the Army Corps of Engineers, Bonneville Power Administration and special interest groups gathered at Bonneville Dam last September to celebrate "the collaboration that is bringing more fish home," according to a Sept. 30, 2014, U.S. Army Corps of Engineers press release. "These efforts to protect Columbia Basin salmon and steelhead represent one of the largest fish and wildlife programs in the nation," said Bonneville Power Administration Administrator Elliot Mainzer. "With our federal, state and tribal partners, we are continually improving conditions for salmon in the streams and tributaries, in hatcheries, in fish passage and on the river." The problem is, they've done just about everything except fix the problem, and this year's huge death toll is clear evidence of that. Four dams on the lower Snake River are four dams too many for Idaho's iconic fish, and four dams too many for water temperatures in the Snake and Columbia river system even under the best of conditions, much less during a hot and dry 2015. Greg Stahl is communications manager at Idaho Rivers United, a nonprofit conservation group dedicated to protecting and restoring Idaho's rivers and wild fish.